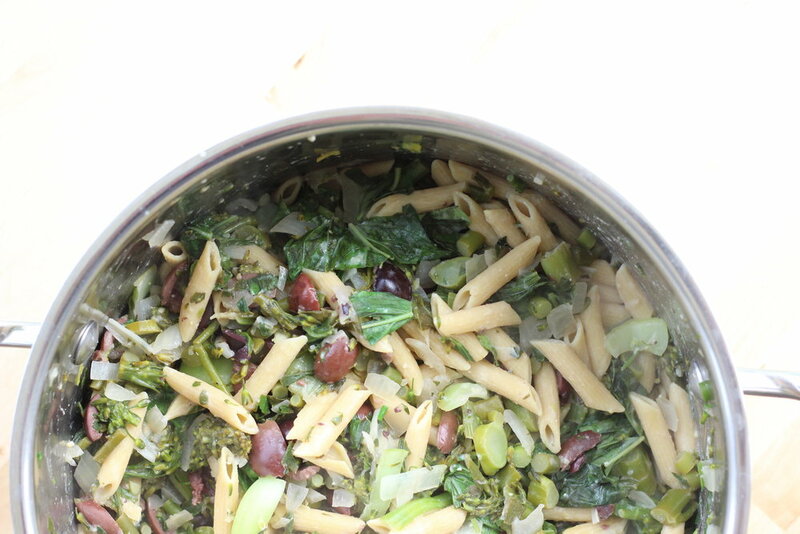 I love making spring pasta dishes with tons of veggies. I also love a simple spaghetti with tomato sauce, but it’s always exciting to change it up with more vegetables. 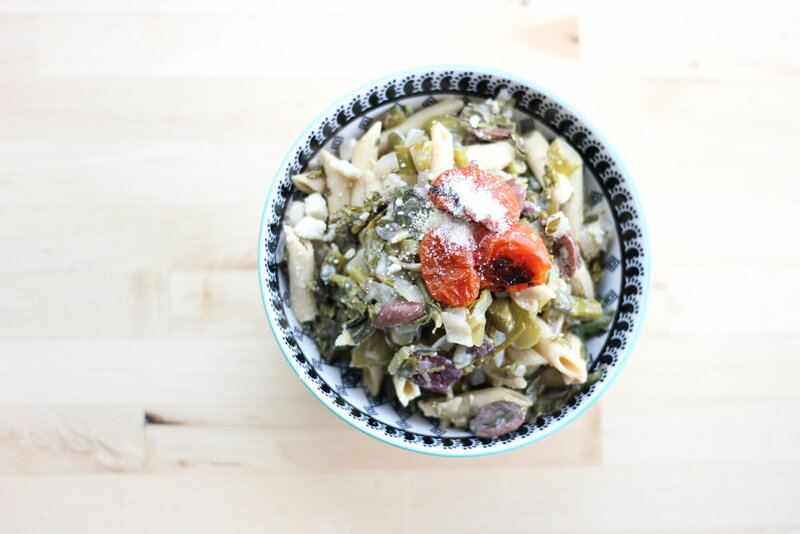 This recipe uses garlic scapes, which is a vegetable I’ve had a long love affair with, and fresh herbs, which always make everything taste good. I used chickpea pasta for the protein; if you wanted to use regular pasta and still wanted a protein component, throw some peas in there! There’s also tahini, which helps with protein, healthy fat and of course tastiness. 1. Cook the pasta according to instructions, reserving ½ cup of the water before draining; set aside. 2. In a deep skillet or pot over medium heat, cook the onions in a little oil or water for ~7 mins, allowing them to sweat. If they char a little, add a splash of water to the pan to deglaze. It will taste all the better for it! 3. Add the scapes and broccoli and cook for a further ~3 minutes. 4. 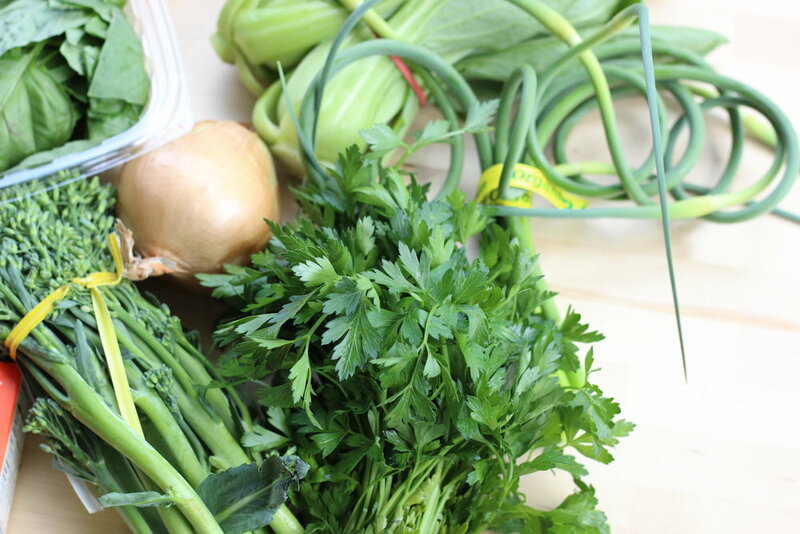 Add the remaining ingredients- bok choi, parsley, lemon, miso, tahini, and pasta water as needed to thin. Stir until miso + tahini are dissolved. Add the basil and pasta, stir to combine. 5. Top with roasted cherry tomatoes + vegan parm, a sprinkle of fresh herbs, or whatever you want! Serve up and enjoy!